Unlike in Southern California, where there seems to be a Tesla in every pot, the chances of pulling up next to a Model S P100d here near Malaga in southern Spain are pretty slim. So it’s easy to be smug when you’re driving a 2018 Porsche Panamera Turbo S E-Hybrid Sport Turismo. Use its launch control and Porsche says the plug-in hybrid can hit 60 mph from a dead stop in just 3.2 seconds. I’m pretty sure we can take the poor soul in the aging Kia Picanto. From the looks of things we can take everyone. Here, the 86-hp Picanto has some balls. Porsche has been in the electrified-car business for some time, but the going has been slow. The German automaker’s best-known hybrid, the 918 Spyder hypercar, hit in 2013. About 1,200 were built. In 2016, Porsche sold just 2,504 hybrid Panameras and Cayennes in the United States, and that was a 66 percent increase over the year before. Well, here comes the onslaught. In 2018, Porsche will introduce six E-Hybrid variants of the all-new Panamera, and a plug-in hybrid variant of the all-new 2019 Cayenne is coming. The electric motor is powered by a liquid-cooled lithium-ion 14.1 kWh battery pack mounted behind the rear suspension under the cargo floor. It alone adds 280 pounds to the portly Porsche, which weighs more than 5,000 pounds. But its placement lowers the vehicle’s center of gravity and helps offset the mass of the front-mounted engine, motor and transmission. 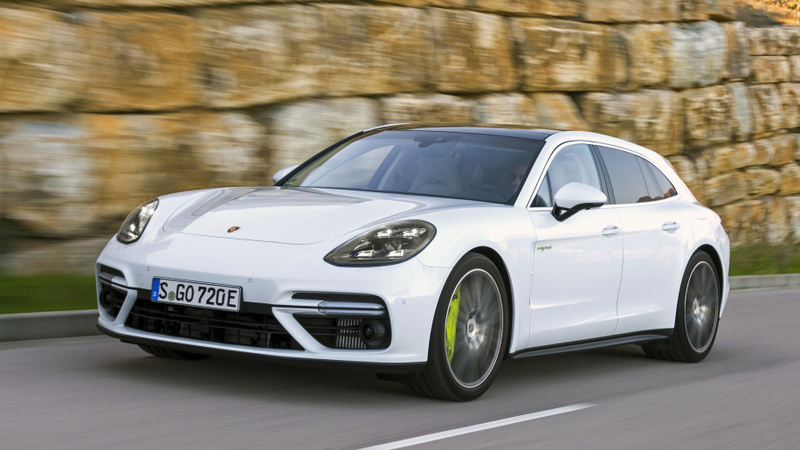 The batteries also give the Panamera the ability to be driven 30 miles as a pure EV. Porsche says the battery pack can be fully charged in 12 hours with a common 120V connection. If the optional 7.2 kW on-board charger is used instead of the standard 3.6-kW unit, the charging time decreases to less than three hours with a 240V connection. Porsche makes no mention of wireless charging, which is being hyped by BMW on its 530e iPerformance. All-wheel drive is standard, as is a long list of Porsche’s state-of-the-art, high-performance hardware including Porsche Dynamic Chassis Control Sport (PDCC Sport), Porsche Torque Vectoring Plus (PTV Plus), Power Steering Plus, the Sport Chrono Package and Porsche Active Suspension Management (PASM) with a three-chamber air suspension, which provides incredible body control and a supple ride. On the narrow mountain roads east of Ronda and north of the coastal playground of Marbella, the Porsche defies its size like an NFL lineman with quick feet. Later that night over drinks, the Panamera director of powertrain tells me that the Panamera’s awesome stability is due in part due to its Porsche Active Aerodynamics (PAA) system which manipulates the angle of the rear spoiler depending on speed and need. In Sport and Sport+ modes, at speeds of more than 55 miles per hour, the roof spoiler automatically moves to the performance position with an angle of +1 degree to increase stability and lateral dynamics. In normal driving, the spoiler remains retracted with an angle of -7 degrees to reduce drag and optimize fuel consumption. Porsche says overall range and EPA-rated fuel economy numbers will be released closer to the Panamera Turbo S E-Hybrid Sport Turismo’s on-sale date. And just in case you were wondering, it is officially the longest name for a car in the history of Porsche. They saved it for a good one.